What in the world was that? Redshirt junior Corey Dauphine screaming down the sideline for yet another Green Wave touchdown? No, just the first two weeks of the Tulane football season flying by. As the weekend quickly approaches, it is time yet again for the Wave to begin preparations for its next game, this time paying a visit to the University of Alabama at Birmingham Blazers. The Wave is rolling into Saturday with force, having completely swamped the Nicholls State University Colonels last week by a score of 42-17. 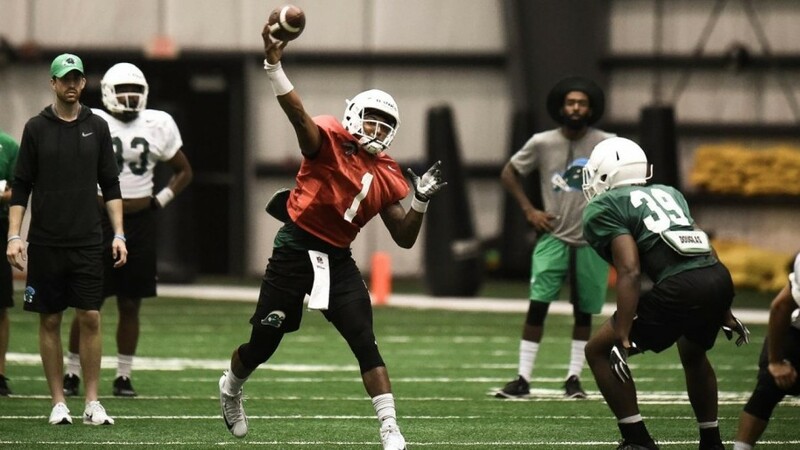 UAB will be seeking to further its current seven-game home winning streak as well as right the ship following its 47-24 loss at Coastal Carolina University. UAB will be looking to slow the Green Wave rushing attack in the matchup. Tulane’s typical option-based offense proved absolutely lethal this past weekend, with running back Corey Dauphine and senior quarterback Jonathan Banks combining for a total of four rushing touchdowns. Furthermore, Dauphine and junior partner-in-crime Darius Bradwell compiled a total of 245 rushing yards in the blowout. The team’s successful system has not gone unnoticed, as Blazers coach Bill Clark had high praise for the Green Wave offense. Tulane looks to have its hands full as well going into the weekend: the Blazer ground game is alive and quite well. In each game this season, the team has rushed for no less than 285 yards. Thus, the UAB rushing attack has been ranked No. 1 in Conference USA and No. 18 in the nation. With this in mind, Green Wave coach Willie Fritz has stated the duel will be yet another statement game in his program’s future. Given each team’s offensive prowess, expect this to be a high-scoring shootout. The Wave’s defense has held fairly strong against opposing ground games so far but may have trouble stopping this highly regarded rushing attack. Only time will tell which offensive arsenal will prevail. Regardless of previous records, both Tulane and UAB will be fervently preparing leading up to this 10th all-time meeting between the teams. The Green Wave holds a slight lead in this series, 5-4. Kickoff will be at noon this Saturday at Legion Field in Birmingham, Alabama.